“Office Space” holds a special place in my heart. In 1999 when I saw the film in the theatres I was about the same age as the characters in the film, grew up amidst the same suburban office wasteland and then working in an office environment with all the same idiosyncrasies of Mike Judge’s razor sharp satirized soul-sucking IT company Initech. It's the 10th Anniversary of "Office Space" and despite two other equally funny office satires on television, Mike Judge's film still feels relevant and holds up as one of the great comedies over the last decade. The opening scene is so simple, something which could have been a sketch bit on Mr. Bean, Peter Gibbons (Ron Livingston) Judge’s 20-something everyman, driving to work. His frustration is palpable as he struggles against the deadening commuter traffic, inching his way along the highway slower than a crippled elderly man walking on the sidewalk. Peter works for Initech, an unspecific IT company amongst an army of moderately paid and exploited university grads who don’t have the balls to quit or do something positive with their lives. Among them are Michael Bolton (David Herman), a constant complainer who thinks he’s smarter then everyone and Samir (Ajay Naidu) an immigrant who doesn’t get why no one can pronounce his name correctly – Nagheenanajar. When Peter gets hypnotized by a psychiatrist to be happy at work, he finds himself with a freedom he’s never experienced. He can show up late to work and not care, and without fear he even asks out the hot waitress (Jennifer Aniston) from the local watering hole. But when the smug ball-busting company President Bill Lumbergh (Gary Cole) hires a consultant to locate the layoffs Peter and his pals decide to take revenge and rob the company of millions of dollars in a backdoor financing scam, like ‘Superman 3’. The film is not particularly cinematic, arguably it's a series of situational and observational sketch gags strung together against a screenplay template. But these gags, characters, situations, and jargon are now part of the modern pop lexison - the super chirpy gal who phrases "a bad case of the Mondays", the ‘flare’ Joanna is loathe to wear at her franchised family restaurant, the “O-Face” which the office fratboy demonstrates to entertain his pals with, Lumbergh’s generic bureaucratic TPS reports, and the symbol of Peter’s repetitive petty annoyance, ‘didn’t you get the memo?’. Though Ron Livingston is the hero, he serves not to convert punchlines but as our entry point into Judge's satirical world of corporate culture. It's the supporting characters who prop up the comedy and steal every scene. Modern shows like “The Office”, and “How I Met Your Mother” offer a similar male-centric take on the twenty-something yuppie demographic – a rom com about males' relationship with other males. Judge precisely nails this distinct middle class male psyche - men who barely have grown up since childhood, who live vicariously through other people’s lives, and exert career envy and frustration with passive aggressive transference. Like most dudes, we all have schemes and dreams of grandeur. Like Michael's hip-hip gangsta fetish, Peter’s admiration for his laid back construction worker neighbour, and who could forget the pathetic Tom Symkowski who tries to impress his young colleagues with his ‘jump to conclusions mat’. Everyone in “Office Space” is pathetic. Mike Judge’s spot-on satire of office life is applicable to anyone’s lives and the frustration, fear, regret and self-loathing we all feel about our own careers. And yes, I have moved from that Initech job from 1999, but I can bring it all back with each viewing of "Office Space". A friend bought Super Troopers and "Office Space" was included as a free bonus. He was about to give it away without watching it until I insisted he check it out. He kept it and watches it regularly. I don't even recall it coming out in theatres. I watched it on DVD by recommendation and it remains a classic! Hey great post. Helped me a lot in my thinking of whether I should get a virtual office. I think it’s a much cheaper alternative for this moment of time. 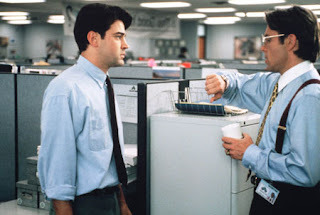 I was recommended Office space by a friend and watched it on DVD I thought it was so funny and anyone who has ever worked in an office or spent any length of time in one will love this film.